Karin has been teaching yoga and meditation full-time since 2008. She teaches weekly classes, workshops and coaches individuals. She is a certified Embodied Yoga Principles teacher and Embodied Facilitator (2017 graduate), has a Masters of Science degree in Mindfulness Studies from the University of Aberdeen and delivers British Wheel of Yoga accredited yoga teacher training. 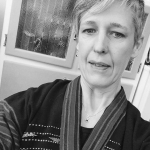 She has taught yoga and mindfulness courses around the UK, in Belgium and has recently taught medical students, young nuns and school teachers in Bhutan. She regularly organises meditation retreats at Minster Abbey in Kent and she is part of the team organising Tsoknyi Rinpoche’s annual retreats in the UK. Prior to teaching yoga Karin worked in the arts, developing & delivering community arts projects promoting social inclusion and community cohesion. She has always worked from a compassionate motivation to make the world a more creative and joyful place for everyone, and making yoga and meditation accessible to more people. This informs her current thinking about yoga and mindfulness teaching and practice. Her teaching and coaching practice is currently inspired by the exploration of the embodiment of different forms of movement including martial arts and dance. Her work and practice is also strongly influenced by her practice of Tibetan Buddhism and her active involvement with Thich Nhat Hanh’s Community of Interbeing which promotes a socially engaged Buddhism in the UK.